Airborne은 쾌적하지 못한 나쁜 공기로부터오는 각종 바이러스로부터 여러분을 보호해 줍니다. 감기 증상 초기 또는 공기가 좋지 않은 장소에 들어갈 때 꼭 드시면 효과가 있습니다. 비행기, 사무실, 학교, 식당, 헬스클럽, 극장등 많은 사람들이 모이는 곳에 가실 때 드십시오. 비타민 C와 zinc가 포함된 17가지 성분이 들어 있습니다. 미국에서는 많은분들이 주머니 또는 핸드백에 가지고 다니면서 드시는 인기있는 제품입니다. 미국에서 베스트셀러 No. 1 제품입니다. 드시는 법 : 감기 초기 증상때, 적은양의 물에 Airborne 1정을 넣고, 1분정도 기다리시면 Airborne이 물에 용해됩니다. 그러면 마시면 됩니다. 필요에따라 매 3시간마다 드십시오. 어린이는 1/2 (반) 정만 드십시오. 임산부 또는 약을 복용하고 계신분은 의사와 상의후 드십시오. "Thank you for using Airborne! 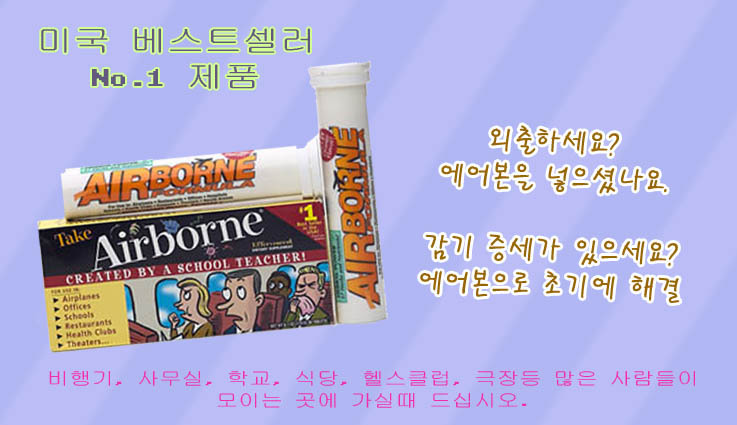 I created Airborne because, as a teacher dealing with young children, I was sick of catching colds in the classroom. "* -Victoria Knight-McDowell, 2nd grade teacher & developer of Airborne Formula. Take at the FIRST sign of a cold symptom* or before entering crowded environments. **Herbal Extracts (from supplement facts): Proprietary Blend of Maltodextrin, Lonicera, Forsythia, Schizonepeta, Ginger, Chinese Vitex, Isatis Root, Echinacea. Next time, 'plop' the AIRBORNE! Directions: At the FIRST sign of a cold symptom, simply drop (1) Airborne tablet in a small amount of plain water, let dissolve (about 1 minute) and drink. * Repeat every three hours as necessary. Children: One half tablet. As with all dietary supplements, pregnant women or people on medication should consult physician before taking. Warnings: This product is not intended to diagnose, treat, cure or prevent any disease.